By combining x-ray computed tomography (XCT) and fluorescence molecular tomography* (FMT) they have been able to generate a 360° image. The combined use of these two proven procedures opens up great possibilities for non-invasive diagnostics, for example in lung cancer (published online, ahead of print, in the journal Nature Methods). 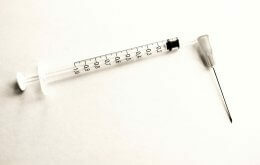 Precise localization is important, particularly in the case of pathologically altered tissue. Prof. Vasilis Ntziachristos and Prof. Martin Hrabé de Angelis and their staff from Helmholtz Zentrum München and the Technical University of Munich can now do this. 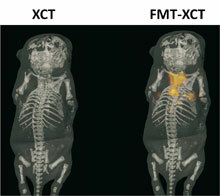 By combining XCT and FMT imaging, they achieved much better results than with either method on its own, and were thus able to diagnose lung cancer in live mice and to observe bone growth. “Thanks to this new development we can diagnose much more precisely where tissue changes have taken place,” says Prof. Ntziachristos, Head of the Institute for Medical Imaging at the Helmholtz Zentrum München und the Technical University of Munich (TUM). In the next steps, the scientists aim to further refine the in vivo method so that it can also be used in preclinical diagnosis of humans.